CEBU, Philippines － A family of five living on a highland in Lahug, Cebu City in Cebu, Philippines waits for the late evening to come to store water. They understand that because of the elevated land, water flow is challenging and water only arrives when neighboring businesses (a laundry shop, a water refilling station, a fast food restaurant, and several eateries) below, by the busy main road, close after dinnertime. This family store water in three barrels, which could last them two days of drinking, cooking, bathing, and washing the dishes. The difficulty happens when there is no water available at all. In the past week, there was nothing to store for three nights in a row. At the time, in the absence of notice of water interruptions from public utility firm Metropolitan Cebu Water District (MCWD), the mother, Nene, had decided to wait. If, on the fourth night, there would still be no water, she would bring out her containers and ask for some from neighbors who have deep well pumps. Other families are experiencing water scarcity, too. A household in Liloan town competes with neighbors for water when it comes around 7 a.m. Another household living in Cabancalan, Mandaue City complains of lack of water for several days in a row. The reasons MCWD, which is charged with water supply and distribution in Metro Cebu, usually give in their notices of water interruptions are technical: rehabilitation of wells, replacement of discharge valves, transferring of pipelines, emergency leak repairs, power outage, and high turbidity of supply due to heavy rains. But when one checks these notices posted on the company’s Facebook page, there are alerts from residents about low pressure to no water available for days in other areas not covered by the water interruptions. This is a manifestation that the increasing and varied demands of residents in Cebu has far surpassed the availability and accessibility of potable water. In 2016, MCWD produced more than 214,000 cubic meters a day but the water demand in Metro Cebu has reached more than 385,000 cubic meters a day (MCWD, 2016). The current demand has now reached 400,000 cubic meters a day, which is more than what MCWD is producing at about 234,000 cubic meters a day (Palaubsanon, 2018). 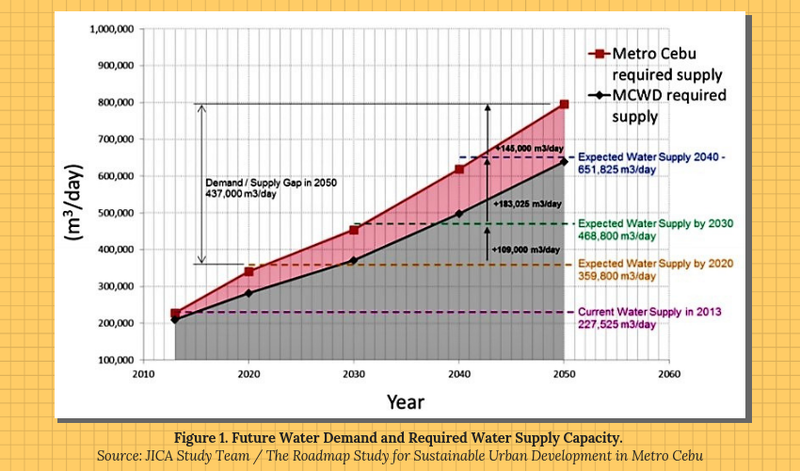 In the Roadmap Study for Sustainable Urban Development in Metro Cebu, the Japan International Cooperation Agency or JICA projected the water demand to reach 800,000 cubic meters a day by 2050 and the MCWD required supply of at least 651,825 cubic meters a day in the same year (Figure 1). There is still the demand and supply gap of around 148,000 cubic meters a day. If residents of Cebu waste water, the demand will increase more and the supply will be at risk. The demand for water continues to increase as Cebu grows. The 2010 Census of Population and Housing recorded Cebu province having a total population of 2.62 million. Five years later, Cebu registered a population of 2.94 million (Census of Population, 2015). Consequently, to cater to the demand for shelter, there are more vertical developments---a total of 33,400 condominium units in Metro Cebu, as of the first quarter of 2018. The purchase of these units is faster as well, reaching 5,600 units compared to the 1,100 house and lots sold, according to the Q1 2018 Provincial Property Market Report for Cebu by the global real estate company Colliers International. Every home alone requires water to sustain the household. The demand for water is inflating but the supply is not catching up as fast as it should. This is why the underserved sector acquire their water from private wells and water vendors while some establishments install their own water pumps, water purification, and desalination facilities (Nacario Castro, 1). And some of them are even illegal because they are extracting water in prohibited areas. Cebu does not have plenty of water to completely serve the demand. Coupled with this are the problems of saltwater intrusion and poor wastewater management. 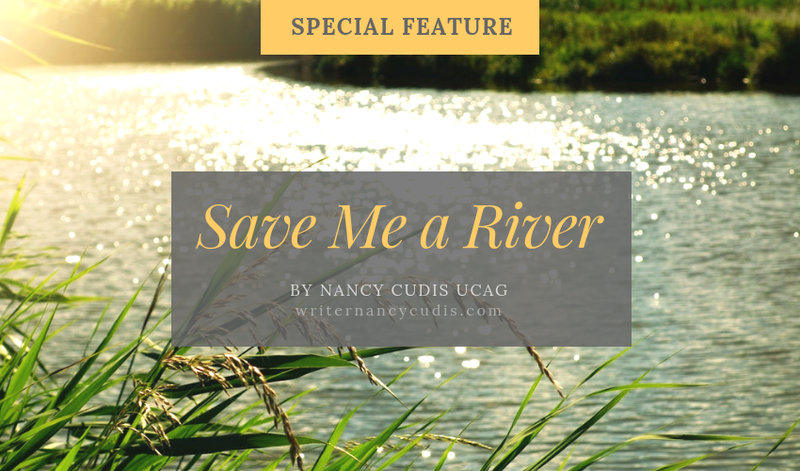 The University of San Carlos-Water Resources Center Foundation Inc. had repeatedly warned that just 50 liters of seawater can already make 1,000 liters of freshwater brackish (qtd. In Mercado, 2011). On the other hand, according to JICA, only 10 percent of wastewater is treated in the Philippines. In some cases, wastewater is disposed directly to rivers and seas, resulting to pollution of groundwater (where MCWD mines about 80 percent of its water supply to distribute across Metro Cebu) and other bodies of water. These realities should give the residents of Cebu the right motivation to break away from the concept that water is unlimited as well as to protect and conserve their limited resources. This prompts the question: How are these realities communicated to the public? In communicating the issues that severely affect the daily needs of the residents in Cebu, including those related to water supply and management, it appears that the Metro Cebu Development and Coordinating Board (MCDCB) subscribes to the reality that environmental programs have a “high order of complexity” that requires “a set of high order communication interventions” (Flor, 100). MCDCB, the coordinating body for metro-wide planning and development in Cebu, has adopted an integrative operational framework for its communication, which involves producing promotional and instruction materials; organizing information, education and communication activities as social interventions; engaging the public and private sector in their communication campaigns; and mobilizing groups into collective action. Through MCDCB’s brand, Mega Cebu, one of its many tools of the trade for the media component of its strategic communication is its Facebook page. While it is simply one of the wide array of platforms available for communicating and raising public awareness on issues related to water, Facebook is still a form of media and it should be used for a better purpose. 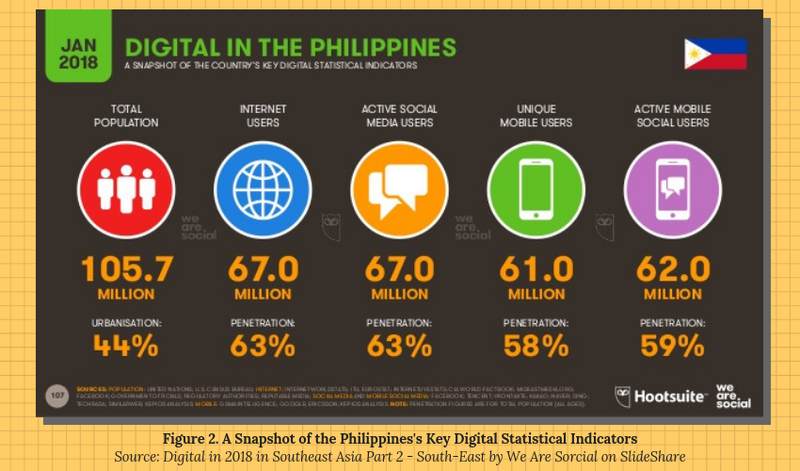 It is also important to note that there are now 67 million active social media users in the Philippines as of January 2018, which is 12 percent more than what was recorded in January 2017, based on the Digital Report 2018 by global conversation agency We Are Social and social media management platform provider Hootsuite (Figure 2). About 89 percent of them use mobile phones. The average daily time spent using social media via any device is three hours and 57 minutes. Facebook remains the most active social media platform in the country, with those belonging to the age bracket of 18 to 34 years old as the most active users. This special report checked the Facebook posts of Mega Cebu in the first quarter of 2018, especially when the country celebrates Philippine Water Week and World Water Day in March, to find any informational or educational messages on water supply and management. 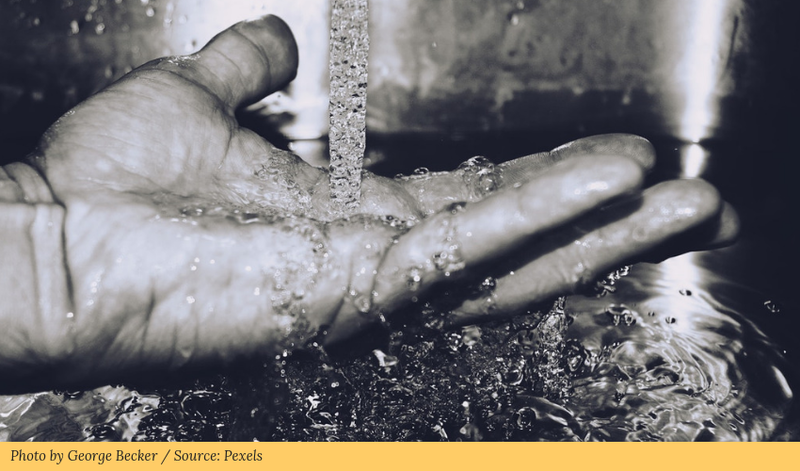 It found that within the first three months of the year, there was only one post related to water, which was also about solid waste management. It is important to note that behind the public posts on its Facebook page are collaborative initiatives organized by Mega Cebu to raise awareness, generate interest, enable decision making, and empower communities to act to address issues related to water, transportation, drainage, solid waste management, and other issues affecting every resident in Metro Cebu. The Mega Cebu Facebook page, according to Caroline Ballesteros, communication and stakeholder relationships manager for Mega Cebu, is a venue to disseminate updates on issues that have been discussed in regular MCDCB meetings and best practices on these same issues. This special report also checked other Facebook pages of groups or institutions based in Cebu that may have supplemented Mega Cebu’s efforts in communicating water-related problems to the public. A Facebook page for the Cebu United for Sustainable Water, a multi-sectoral coalition of institutions and individuals concerned with the sustainability of Cebu’s water supply, could not be found. At the same time, in MCWD’s account, all Facebook posts in the first three months in 2018 are about notices of water interruptions. 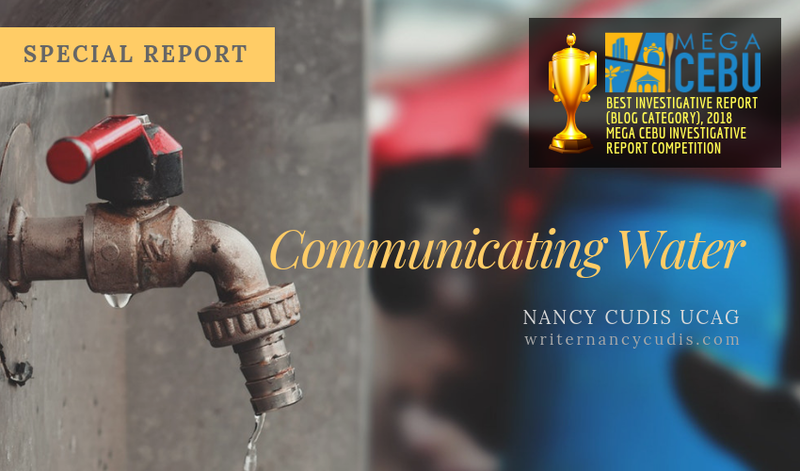 According to Charmaine Rodriguez-Kara, MCWD spokesperson, MCWD currently lack the staff who can dedicate time, focus and energy to use Facebook to communicate messages on water. The Youth for a Livable Cebu is more active in promoting messages that affect water quality and supply, such as poor garbage disposal. Within January to March 2018, out of its 49 Facebook posts, it had pushed at least nine such messages. Even Mactan Rock Industries Inc., a manufacturer of water treatment chemicals and equipment, has several posts in a month about the importance of clean and safe water. Communicating about water-related issues in Cebu should not simply be made of a few Facebook posts published in an erratic schedule. Even these Facebook posts may not have reached to as many people as they were originally hoped to. Still, communicating about water should be a “deliberate exchange of environmental information, knowledge, and even wisdom” (Flor, 4) focused on an issue that urgently needs attention and action, just as how environmental communication should be. Facebook offers that exchange system or venue for transparent dialogue. However, that deliberate exchange is not clearly manifested on Facebook by the selected pages checked by this report. Some organizations in Cebu are missing out on the chance to use social media as a “pressure point to prompt and encourage support during specific campaigns” (Dosemagen, 2016), especially when many people in the country spend a lot of time on this particular social media platform. 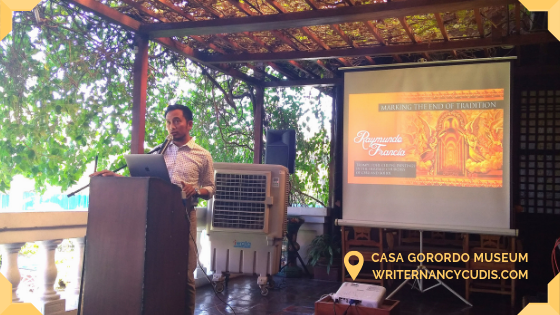 The Ramon Aboitiz Foundation Inc. and Mega Cebu have been organizing a series of Understanding Choices Forum that tackle urban development issues, such as water and waste management held in October 2017. The forums were broadcast on Facebook Live. Also, Mega Cebu launched in the past its campaign, Mega Cebu, Pwede Kaayo! featuring short videos that encourage positive behavior and norms, such as being disciplined and consistent in saving water. These videos can be viewed on Youtube and have been shared on Facebook. MCWD also released short water conservation videos a few years ago. However, Mikodaemus Mamac, a resident of Liloan town; Marie Ferleine Maderazo, a resident of Mambaling town; and Karla Grengia, a resident of Lapu-Lapu City, who are all active Facebook users, are not aware yet of any long-term active movement or campaign online to get people to talk about Cebu’s water problems and do something positive about them. The families of Mamac, Maderazo, and Grengia practice water conservation daily. In their own capacity, these three people remind others on the importance of water or participate in beach clean-ups. But beyond these, they have no idea on what more they can do to help solve the water issues in Cebu. This lack of knowledge results to varied attitudes toward the problem. Maderazo feels helpless and laments about inefficiency when doing house chores due to lack of water. Mamac admitted he sometimes feel fatalistic while Grengia is motivated to do something about the situation. Despite these feelings, they do not deliberately seek information in the media or actively engage with institutions like MCWD or Mega Cebu. Communicating water problems in Cebu can take the form of a creative “communication campaign that is planned, designed, and implemented with specific audiences, messages, media, strategies, and timetables,” or the form of cultural interventions that “involve tapping and nurturing existing or spontaneously occurring cultural phenomena” (Flor, 7). Either way, as a large-scale social change initiative, communicating water issues must feature a participatory structure as one of its key components. Professor John Barry of the Queen’s University Belfast pointed out (as cited in Brulle, 2010) that through participation in collective decision-making processes, citizens acquire the necessary technical and cultural knowledge to make a meaningful contribution. Because public participation and environmental communication is a process that cannot be forced or accelerated (Flor, 195), communicating water issues then requires time and flexibility. People need to know and understand the realities about water in order for them to better control their usage and improve their lifestyle and, in the process, contribute to the sustainability of water resources. They must also always remember that “water is the central resource. It is essential to life and to human civilization and development. Water defines the archipelagic and geologic nature of the Philippines, and determines its culture, agriculture and industry. The many threats to water therefore should be seen as threats to society” (Dayrit, 1). 1. Barry, John. “Vulnerability and Virtue: Democracy, Dependency, and Ecological Stewardship. Democracy and the Claims of Nature, edited by Ben A. Minteer, Bob Pepperman Taylor, Rowman & Littlefield, 2002. pp. 133-152. 2. Brulle, Robert. “From Environmental Campaigns to Advancing the Public Dialog: Environmental Communication for Civic Engagement.” Environmental Communication, vol. 4, no. 1, 2010, pp. 82-98. 4. Census of Population and Housing; Census of Population; Quickstat Cebu: Monthly Update of Most Requested Statistics as of June 2018; Philippine Statistics Authority, June 2018; Cebu June 2018. 5. Dayrit, Fabian. Agenda for Hope: Ideas on Building a Nation: Promoting Sustainable Development, Managing Water for a Sustainable Future. Ateneo de Manila University Loyola Schools, 2009. 6. Dosemagen, Shannon. “Social Media and Saving the Environment: Clicktivism or Real Change?” Huffington Post, 28 Jan. 2016, huffingtonpost.com/shannon-dosemagen-/social-media-and-saving-t_b_9100362.html. Accessed 27 Sept. 2018. 7. Flor, Alexander. Environmental Communication. University of the Philippines Open University, 2004. 8. Grengia, Karla. Personal interview. 25 Sept. 2018. 9. Japan International Cooperation Agency; Metro Cebu Development and Coordination Boards; The Roadmap Study for Sustainable Urban Development in Metro Cebu; JICA, June 2015; table 10.1. 11. Maderazo, Marie Ferleine. Personal interview. 25 Sept. 2018. 12. Mamac, Mikodaemus. Personal interview. 25 Sept. 2018. 14. Mercado, Juan. “Cebu’s aquifers running on empty.” Inquirer Visayas, 19 August 2011. newsinfo.inquirer.net/44459/cebu’s-aquifers-running-on-empty. Accessed 23 Sept. 2018. 15. Nacario-Castro, Evelyn. “Water, Land, and Peace--three elusive elements in Cebu’s development.” When the Well Runs Dry: A civil initiative in watershed planning and management in the Philippines, 1997, pp. 1-2. 16. Palaubsanon, Mitchelle. “MCWD braces for El Niño, looking for water sources.” The Freeman, 02 Sept. 2018, philstar.com/the-freeman/cebu-news/2018/09/02/1847997/mcwd-braces-el-nio-looking-water-sources. Accessed 23 Sept. 2018. 17. We Are Social. Digital in 2018 in Southeast Asia. 29 Jan. 2018, slideshare.net/wearesocial/digital-in-2018-in-southeast-asia-part-2-southeast-86866464. Slides 106-141.